I keep telling people this is not a cycling blog. Mostly it is a ‘small stone’ blog but once a week a write about other things that interest me. Of late I admit that most of those ‘other things’ have been about cycling. That’s because it is summer and I am doing quite a lot of cycling at present. So now I am about to bore you with a bit more cycling. Recently two things came together. First as I mentioned in my previous recent posts we have been exploring some trails listed in our Sustrans book and secondly our daughter Rebecca who lives is Spain and blogs at: https://madcyclinginthemiddaysun.wordpress.com. was over for a few days to compete in the UK National MTB Marathon Championships on the Isle of Man (she came 2nd) and managed to spend the odd day with us either side of her competition. What connection do these things have? you might ask. Well we all decided that while our daughter was here we would go out for a family ride, my husband, me, daughter, two sons, daughter-in-law and grandson – all 7 of us. There is a local trail ride along a disused railway line that is not listed in our Sustrans book as a day ride although it is part of the National Cycling Network. The Stafford Greenway begins some 7 or 8 miles from our home and it goes all the way to Newport in Shropshire – about 20 miles. We have never ridden this route. It’s funny how you often don’t visit the places nearest to home! Anyway we thought this would be a good ride for our grandson to tackle on his new bike so off we all went on Tuesday last week, drove into Stafford, parked the cars, unloaded the bikes and rode along the trail from the centre of Stafford to the village of Haughton (about 5 miles) where we left the cycle route to ride into the village for an ice-cream at a lovely farm park. Here sadly my grandson got stung on a finger by a bee which curtailed the ride as he couldn’t hold his handle bars due to the pain and swelling. So Dad (my eldest son) had to cycle off the get their van to pick up him and Mum while the rest of us made our own way back at a slightly faster pace. In total about 10 miles round tip for the afternoon. Someone kindly took a picture of us all on hubby’s camera but as he hasn’t yet downloaded it to share with me I can’t share it with you. The day ended with them all coming to us for dinner, finger well recovered by then and all smiles again; a wonderful end to the family day. After our daughter returned to Spain on Wednesday hubby and I decided it would be nice to do a bit more of this local route, so on Friday we cycled into Stafford then we picked up the trail and rode along the route the opposite way to the direction we had gone before, right to the ‘end of the line’ at Beaconside on the outskirts of Stafford, then by various roadside cycle lanes and country roads in a big loop back home. A trip of about 20 miles. On Sunday we decided on yet another stretch of the Greenway trail. We cycled via country lanes to the village of Haughton, picked up the trail where we had left it on our family ride and rode along to the next village, Gnosal, where we again left the route and made our way home via the lanes, which included a stop for a drink and a bite to eat at Norbury Junction beside the canal. Then we tackled the steep hill up to the village of High Offley (the hint is in the name). We have only attempted this hill 2 or 3 times before and I have always had to get off and walk the last part of it. On this occasion, I am pleased to say, I managed to get all the way up – it felt like a real achievement! The round trip this time was about 19 miles. 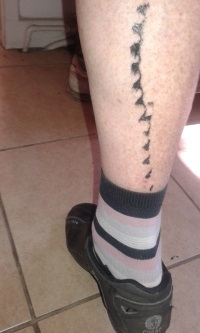 When we arrived home I discovered I had acquired a tattoo! 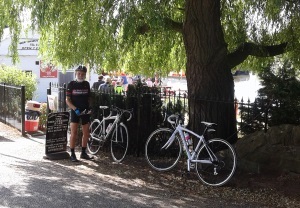 At one of our stops for a swig of water and a muesli bar I must have leant my leg against my chain ring, which my husband had kindly oiled for me that morning. Why me? This, I might add, is not the first time it has happened, nor will it be the last I do not doubt. We thoroughly enjoyed all three trips along sections of this trail. The first was precious as we were out in force as a family and the third was enhanced by my hill achievement. We have now decided that having neglected this lovely trail so close to home for so long we really ought to go and cycle the whole route – once we have worked out the logistics of getting to and from the start and finish. If we drive to Stafford we will need to get back from Newport somehow to pick up the car – a return trip of another 20 miles if we cycle back the way we went. If we set off from home by bike it will add another 7-8 miles to the start and another 9 or 10 miles back from the finish – we will need to pick a fine and fairly cool day when we are feeling energetic. No doubt if and when we do it I will report on the ride here! Yes, I know this isn’t a normal day for me to post and I am not posting a ‘small stone’ today, I just wanted to update you with Day 6 of the Cycling UK 7 Days of Cycling Challenge. We are off tomorrow for the weekend at the Eroica Britannia classic bike festival and I will be off-line until our return on Monday. This doesn’t mean we will miss out on our Day 7 ride as we will be riding on our tandem (yes we’re taking that as well as our classic bikes!) from the campsite to the festival and back, probably about 8 miles in all, and we’ll do it again on Saturday. We will then have to do it yet again on Sunday with the classic bikes in order get to the start of our 30 mile ride over the Derbyshire hills and dales; I just won’t be able to report it until next week! 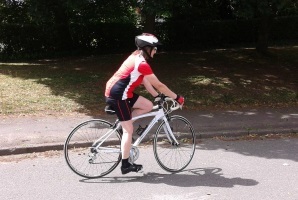 Day 6 (today) was simply a chance to spin the pedals round briefly and not miss out a challenge day. Our excuse is that we had a busy day and were short of time. We needed to go to the grocers, pack for the weekend and load up the motorhome. Hubby’s ride was only down to the local Pharmacy and back to pick up his prescription while I went out later on my own, just a jolly round a short local loop. 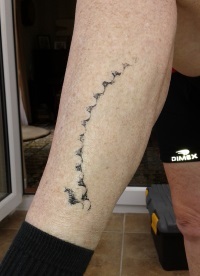 Somehow I seem to have acquired a ‘tattoo’ on the short trip (probably while checking the stats on my bike computer on my return). I did about 3.5 miles, that’s all. We’ll be making up for it with longer rides over the weekend at The Eroica Britannia Festival.